As an autistic academic and parent to an autistic son, it is usually with some trepidation that I approach media representations of autistic people. 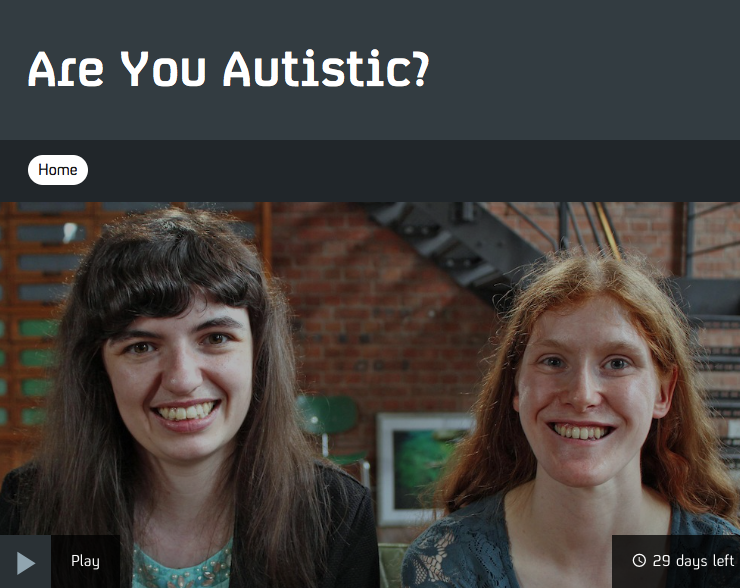 This program was no exception, having followed on from a survey entitled 'How autistic are you?'. The program was, however, refreshingly presented by two young autistic campaigners, and followed two adults in their 30s through diagnostic assessments and a range of cognitive experiments. Whilst the program contained some contested and tired interpretations and explanations for the actions of autistic people, such as the ‘theory of mind’ hypothesis alluded to in one of the activities used, it also contained some more interesting psychological tests. There were contributions from Anna Remington and colleagues from University College London in regard to perceptual load, as well as an experiment regarding the difficulties autistic people can have when plans and focus are diverted. The narrative therefore fluctuated between the established ‘experts’, often depicting a purely clinical deficit model of autism, and autistic people and upcoming academics using a more respectful language of difference. The content in regard to how autism is defined and diagnosed was somewhat limited. A graphic indicating autistic traits as a constellation was used, yet not fully explained, potentially leaving the viewer with a confused or simplistic understanding. This was counteracted, though, by the undoubted highlight of the program – the number of autistic voices talking about their own lived experiences, including an amusing comment regarding Simon Baron-Cohen’s theory of the ‘extreme male brain’. The narrative assumed that the ‘lost generation’ would be ‘suffering through life’ without diagnosis, and that diagnosis was a key to self-understanding and the explanation of difficulties faced. Key to this message was the emphasis on the traditional under-diagnosis of autistic women. It was remarked upon that not enough research had been done in this area, and that social masking could be a major reason for this disparity. Yet the programme did not explore the gendered cultural context of diagnostic practice in great depth, nor post-diagnostic support. The program will also no doubt anger those who would like better representation of those on the autism spectrum who would be classed as having intellectual disabilities. Although briefly mentioned, this aspect of the lived experience of autistic people hardly featured. Although identifying some of the potential difficulties autistic people face in navigating social life, the program somewhat failed to look into the inter-subjective and socially situated nature of many of the issues raised. - Review by Dr Damian Milton, Lecturer in Intellectual and Developmental Disabilities, Tizard Centre, University of Kent. Watch the programme now. Find much more about autism in our archive, and a special edition in our free iOS/Android app. In particular, read our interviews with Francesca Happe and Simon Baron-Cohen and this 2007 piece from Liz Pellicano.